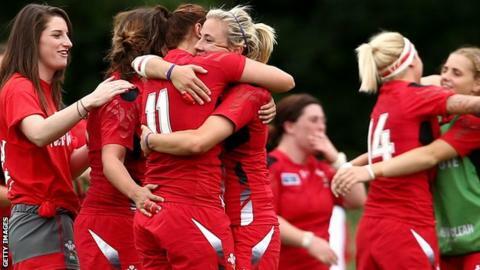 In her first column for the 2015 Women's Six Nations tournament, former Wales full-back Non Evans is optimistic for the team, despite the side winning only one match in the 2014 event and being placed eighth out of 12 teams in last year's World Cup. Sunday's Six Nations opener in Swansea is the perfect time to face England. It's now or never for Wales. England are reigning world champions and traditionally they dominate the Six Nations, but there won't be a better time to play them. That's because England are without 14 of their best players, who are currently away with their sevens team. It was announced last year that England's top female rugby players would be paid for the first time with the Rugby Football Union giving full-time contracts to 20 players. The sevens team are currently competing in the World Rugby Women's Sevens Series, at which England will attempt to qualify for the Rio Olympics on behalf of Great Britain. Among those chosen for full-time contracts are 12 members of the England squad that won last year's 15-a-side Women's Rugby World Cup. And with the likes of the iconic Maggie Alphonsi retired from the game as well, this is the best chance for Wales to beat England. Wales only lost 20-16 to a full-strength England two years ago, and I think they're more than capable of beating them this year. I'm particularly optimistic having seen the side Wales have selected for the game at St Helen's on Sunday. Wales had one of the youngest teams at the World Cup, and there were some encouraging moments such as the 35-3 win over South Africa. Sioned Harries scored a hat-trick that day, and I'm expecting her to impress again at open-side against England. The captain Rachel Taylor has moved from the back row to lock, where she'll be joined by one of two debutants, Rebecca Rowe. I've heard very good things about Rowe and her fellow debutant, Gemma Rowland, who starts at inside centre. With Adi Taviner at number 13, I'm expecting big things from an exciting Welsh backline. Head coach Rhys Edwards has picked another young team but, with the likes of Caryl Thomas and Catrin Edwards at prop, there is more than enough experience in that line-up. With a nice balance in the Welsh side - and England without so many of their best players - I think Wales should be quietly confident. England tend to start the Six Nations as overwhelming favourites and, having won the World Cup last year, some might expect them to walk it this time. But as I mentioned earlier, they'll be weakened by all those players missing because of sevens commitments. They've still got eight World Cup winners in their squad, though, so you can't rule them out. Having won the Grand Slam last year, France will be among the leading contenders to win this year's championship. They reached the World Cup semi-finals as well but, like England, they're without a number of players on sevens duty. Ireland were also World Cup semi-finalists and, after a second-placed finish in last year's Six Nations, they'll be strong again. With three teams which reached the last four of the World Cup to compete with, Wales have a formidable challenge ahead of them. But I think they'll be dark horses, having developed so much in the last year and with so many depleted opponents. They should be too strong for Italy and Scotland, while I could also see them giving Ireland and France a scare. It all makes Sunday's opener against England all the more important. If they can start with a win, Wales could build some momentum and put themselves in contention for the title. That would usually seem a tall order against England, but this is the perfect time for Wales to take on the world champions. Non Evans was talking to BBC Wales Sport's Dafydd Pritchard.